A garage worker has been left terrified after being held up at gunpoint in the early hours of the morning. The woman was threatened with what appeared to be a handgun in the Phoenix Filling Station on Keppochill Road at about 01:30 on 10 September. Two men left with a three-figure sum and headed towards the nearby Cowlairs Park. 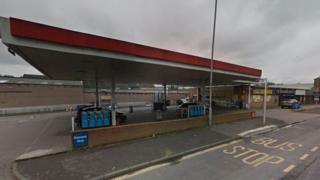 Det Con John Tweedle called it a "terrifying ordeal" for the woman working in the petrol station. The first suspect, who was holding the handgun, is described as white, 5ft 8in, and wearing black Adidas jogging bottoms with royal blue stripes down the sides, a black jacket with the hood up covering his face and a black glove on his left hand with a white motif, possibly a Nike tick. The second man was white, wearing a navy blue Crosshatch puffa jacket with an orange or red zip, orange hood lining and a noticeable rip on the right shoulder at the back with white padding sticking out. Anyone with information is encouraged to get in touch with police.